Note that this is not a paid promotion for John Harding, but since we have posted several times in the past regarding the apparent HoneyBee die-off , Colony Collapse Disorder (CCD), John had emailed directly regarding the subject. Being a career beekeeper, we thought it would be an interesting point of view to present John’s opinion into the mix with his permission. It’s a long read, but may be of interest to some of you, especially knowing that we can’t live life as we know it, without Bee pollination. My name is John Harding and I have found the answer and solution to stop honeybees dying. It is nothing to do with any man-made product. Honeybees were dying before any pesticides, mobile phones, G M crops or whatever you care to mention was manufactured. Below, in two parts are the reasons why. The First part is an extract from my book. The second part is from a proof copy leaflet that was presented by myself to all delegates of the International Bee Research Association (IBRA) Conference held in the UK on the 29th January 2011. Please enjoy reading and realise honeybees have been dying for centuries. I am sure you are aware of the plight of the Honeybee worldwide. Beekeepers need an answer. Initially Apiarist worldwide was putting the blame for the Honeybee demise on the doorstep of the Chemical and Mobile Phone Industries. Honeybees are dying out at an alarming rate with no one knowing why. Pesticides, CCD, GM crops, Climate change, Mobiles, Global warming or perhaps someone or something to blame would be acceptable to everyone. There are many possibilities being put forward but as yet, no answers. The parasitic mite called Varroa is not helping matters with its contribution. However there are two common denominators why Honeybees are dying worldwide. Chemical companies are investing millions worldwide in Universities, Scientists, Professors, Doctors, Institutes, Beekeeping Organisations and whoever, so they just might find a chemical or bacterial answer for the parasitic mite called Varroa that is sweeping the continents devastating Honeybees. Mobile Phone Companies are in denial not wanting the blame. Chemical companies need an answer whether it is one or the other so they may recoup their investment and profit from beekeepers worldwide in selling their product. Was Albert Einstein right in his alleged statement? “If Honeybees die out then mankind will follow 4 years later” the chances are that it won’t be 4 years due to other foods such as rice being available but it will happen eventually as honeybees do pollinate 35% of what we eat. 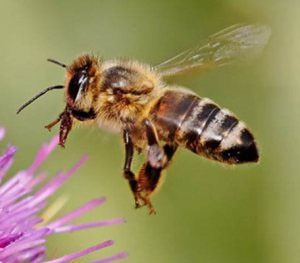 Once Honeybees are gone, Honeybees are gone for good! I am a beekeeper of 30 years` experience, keeping up to 300 beehives, until 6 years ago. I have invented beekeeping equipment in that time that I am proud to say, does bare my name, “The Harding Queen Rearing System using Two Queens” and “The Harding Mini Nucleus Complete System” (as seen on the internet website for BIBBA). These are an inclusion of this book, Chapter Three & Five. During my life’s work things happen and you wonder at nature, how perfect is the Honeybee micro-world, why would you want to change it and yet mankind unknowingly has changed the Honeybees perfect 200 million year existence to what mankind wants. “The answer and solution to the Holy Grail of beekeeping”. It didn’t start with the Varroa mite 20 years ago, what the Varroa mite did was escalate the problem to what beekeepers had done worldwide, but it did bring it to the attention of the media and mainstream public in the last few years causing an over re-action due to Albert Einstein’s alleged quote. Honeybees started dying out when man found honey, tens of thousands of years ago when man wanted to domesticate Honeybees to harvest honey, putting them into logs, boxes, skeps eventually beehives but taking them away from their natural source of survival and requirements, which keeps their delicate micro-environment alive. The first common denominator for the demise of Honeybees is……… Mankind! Well, Beekeepers now and in the past! So what is the second common denominator? “I have found a natural phenomenon, the bees need it to survive to complete their micro-existent world, and is free. I am the first person in the world to combine Honeybees with this phenomenon, so you can imagine how the chemical companies are going to react after spending millions around the globe. I have approached Universities and Beekeeping Organisations here, in the UK, and abroad with my hypothesis but due to the infiltration of funding from chemical companies or others, University Scientist, Professors or Scholars are unable to take my hypothesis due to inevitably losing their precious funding or being biased to a chemical or bacterial answer”. Yes! It is topical, political and controversial! One single person taking on the might of a billion-dollar pharmaceutical industry and the Hierarchy of the Beekeeping World with every beekeeper past and present being the reason for their demise and the answer being a natural phenomenon which is free. CCD (Colony Collapse Disorder) in the USA is also down to Mankind for the demise of their Honeybees having the same problems as us but with one extra reason that is only in the USA. Whatever you think after you have read my book, I will not be popular with any beekeeper, scientist, professor or anyone looking for a chemical or bacterial answer, but may, just may, stop Honeybees dying out worldwide. That will be pleasing in itself. I am just a passionate beekeeper that has found an answer and solution. This book is a small part of the invisible world of the mysterious Honeybee that is disappearing too quickly. “Albert Einstein did not say that famous quote about mankind dying out. It was a misquote from Albert “N” Stein an American beekeeper of the same era as Albert Einstein. However with accent, dialect and poor communication at that time it was misunderstood”. held at the University Of Worcester on the 29th January 2011. Varroa-still a problem in the 21st century? My name is John Harding, I have kept, researched, experimented, observed and used logic and common sense in trying to keep as much to nature as possible while keeping Honeybees. During the last 30 years I have invented bee equipment that does bare my name. I have not used sugar or chemicals for the past 18 years, due to the first approved licensed treatments killing a percentage of my queens. I hoped that one day I would find a natural remedy for the parasitic mite Varroa. This, I have now done. We know that Honeybees have been on this planet for 100 to 200 million years depending which book you read, so bees have evolved with planet earth. This has brought with it changing climates, polarity change, a change in continents with moving earth plates and a change in flora. In all that time dealing with disease, mites, intruders and any other alien insect or animal, even man. During this time, their home has been in hollow trees, caves or covered protected position so they may get away from draughts, rain or severe weather to build their amazing honeycomb nest that is kept to an accurate temperature +_ 1 degree to raise the numbers required for survival both in summer and winter. Thousands of years ago man found honey. Due to the Honeybees perilous home positions being high in a cave or high up in a tree, man decided to re-home the Honeybee into logs, boxes, skeps and then beehives so as to make it easier to harvest honey. A form of domestication. Has Man made a difference? No, except for realising a unique space (Langstroth) that Honeybees respect meaning we as beekeepers can inspect our colonies with frames rather than killing off the bees that were in a skep over a sulphur pit. This observation only happened 150 years ago. Queen excluders were also invented. Are there any other major discoveries? Yes, Eddie Woods (a BBC sound engineer) discovered 60 years ago inside the Honeybee nest that vibration levels was measured between 190hertz and 250hertz during normal conditions however when swarming this vibration went up to 300hertz. Was any scientific work carried out at the time or later? No! If it had we could be further along the path of understanding the Honeybee better. Beekeeping today is much the same as it was in the beginning except of course the Langstroth frame space and Queen excluder. No, not really except for the amount of knowledge that we have now gained about the mysterious Honeybee, it always seems to be repetition but more in depth, more of a scientific language. Can we still learn from the Honeybee? Using observation and logic and asking “What do Honeybees really want?”. They did not ask to be put into a box or beehive. However, while in our care, we, as beekeepers, should give them and treat them as if they were in a wild state of nature. We know they use electromagnetic north/south in honeycomb building and in flight. We know with a strong colony, disease and varroa can be kept to a minimum. We also know with a colony of strength our rewards of honey is greater. So! What do Honeybees really want? At the moment by the Honeybees themselves to ward off predators, for communication and to keep their micro existent climate to a perfect temperature for brood rearing, but is that sufficient? Unfortunately NO! Can it be found elsewhere? Planet earth has evolved, so trees, animals, plants, fish, birds and insects has evolved with it and so too, Honeybees, evolving with the planet. Which is why Honeybees not only need a high vibration of 250hertz to sustain their microenvironment but actively look for it by swarming. How could man know this? You cannot see, feel, touch or sense it. Planet earth vibrates constantly at 7.83hertz (NASA) unless disturbed. Honeybees are placed by man in a beehive where man wants it, if this is on 7.83htz the bees have to work 31.9 times greater just to stand still. I have reason to believe this weakens their immune system and defence mechanism becoming an easy target for any alien predators like Varroa. Now, not being able to cope, over-stressed, disorder with eventual collapse, dying or disappearance is inevitable. Does planet earth vibrate at this higher level of 250htz? Yes, transmitted upwards through underground rivers. These rivers are everywhere around the planet, like i.e. ; blood vessels in our own body. Remember it has taken 4 billion years to get to where we are today. Everything has evolved together to be where it is and why it is there for a reason. The climate, planet earth and logic has dictated that. Where does the higher earth vibration come from and how? Planet earths normal vibration of 7.83htz gets interrupted by hollow chambers of running water/fluid creating friction allowing oscillation to resonate to become an Electromagnetic Wave Vibration which will increase it up to and above 250htz. The rivers/lines of fluid are normally very close to each other varying in depth and only being up to 4 feet wide, like a cobweb, zig zagging their way across the planet at depths of 200 feet or 300 feet creating vibration and rising upwards to the surface and skywards, creating an electromagnetic curtain that reaches to approximately 30,000 feet. (Birds use this curtain to migrate thousands of miles). I.e. There are 8 rivers/lines in my 3 bed detached house and 80 foot garden, so they are not miles apart. What is the connection of Honeybee vibration 250hertz and Earth vibration 250hertz? We know that Honeybees maintain this vibration within their nests (Woods) It is just too much of a coincidence, using logic, that bees are drawn to it when they swarm. They have evolved together over millions of years. Honeybees, Wasps, Bumble bees, Ants, Cats and much more are all being attracted to and found above earths higher vibration. The honeybees need this higher vibration so they work 31.9 times less. Then are able to deal with any unwelcome intruders, like the Varroa mite. All organism are attracted to or repelled from these lines. Are Honeybees drawn to Planet Earth higher vibration? Yes, every time they swarm. Honeybees always settle above a 250htz line. This has been checked on every swarm collected, about 30, in the past 3 years. All bait hives placed above a line attracted a swarm. Whenever I was called out to inspect abandoned hives there was always one beehive above a line. This was the only hive with bees in and thriving. The others had died. Apiaries were left for 4 years to ascertain for self selection. After this time the only hives that survived were above a line, all the others had died out. In my early days of queen rearing I too thought I had a resistant strain only to find out every one that showed these qualities was above a line. I could not understand why they were so poor when moved to a new site, having shown perfect qualities when in the original site. (This was before I knew about the lines). Any beekeeper that thinks he/she has a Varroa resistant strain. I can guarantee will always be above a line. They have not been killed off by Varroa, it was an assumption, not scientific. Beekeepers are to blame due to putting hives in the wrong place where they die out with Varroa, so no swarms or feral colonies. Feral colonies are still out there surviving. Reduced in numbers, yes, but they are always found above a line. I was invited by Ricarda Kather to explain my hypothesis, while there I checked their apiary without any prior knowledge not knowing which was the best or worst beehive as all looked identical. These I believe were used for Varroa hygiene. I found the two best beehives that gave the best hygienic results. These were above a line. My apiaries have not changed during my beekeeping so observations have been made pre-lines. During all these years Cleanliness, Hygiene and Grooming have always been noticed to be far better than others within the same apiary not realising at that time they were on a line. Honeybees can deal with Varroa when above a line. When above a line the honey yield is always 2 or 3 times greater. The colonies has tended to supersede rather than swarm. Clearly they are in the right place so why swarm? This does beg the question “Is swarming induced by man?” being put in the wrong place by man. How long have they been trying to tell us? Take 2 hives of similar size and queen (“A/B“), both infested with Varroa, place “A” above a line, place “B” away from the line. Hive A; within 6 to 8 weeks this hive will have very little Varroa or none at all and thriving requiring supers. Hive B; after 6 to 8 weeks will still be heavily ridden with Varroa and much weaker. Next season reverse these same two hives (if B is still alive) You will observe B becomes Varroa free and A is infested with Varroa. If you wish using 2 apiaries in the same year the above exchange can be done after 3 months. Take 2 hives of similar size and queen (“C/D”), both infested with Varroa, place “C” above a line, place “D” away from the line. Hive C; within 6 to 8 weeks this hive will have very little or no Varroa (above as A). Hive D will be as B, heavily ridden with Varroa. After 3 months change over the queens from C and D, becoming CD and DC. CD; You would imagine CD would improve D to be Varroa free, not so, it carries on being ridden with Varroa. DC; Is still Varroa free. Conclusion for both case studies……….It is not strain or queen quality but position to where and what the beehive is placed above, i.e. ; an Electromagnetic Geopathic Stress Line that vibrates at 250hertz. Is it the honeybees dealing with Varroa or Varroa not liking the higher vibration? There will always be questions, especially to a way forward. (I have the answer for that to). This is just one question answered to stop honeybees dying. Thank you for reading my hypothesis which is in my book and available. VARROA-STILL A PROBLEM IN THE 21ST CENTURY? NOT ANY MORE! An excellent hypothesis. Q. How do you find the 250 hz lines? A practical way to do it. We are doing research on the effects of continuous exposure here in CT to ILFN (50- very low HZ). The reason is we started having the infamous TAOS HUM in mid 2009 and looking for a cause. Between us and consultants, its proven high levels throughout western CT. We have identified the the source- HP distibution of natural gas/ major capacity and operational changes since 2005 causing ILFN reasonating structures and effecting wildlife here(tens of thousands of forum reports are the evidnece on how expansive the HUM has become since govt allowed major changes in 2004). Not being a biologist(I am an Mech Engr)and simulated tests of inside a box honey bee hive, FFT and 1/3 octave analysis shows reasonance and amplication from teh ILFN impact just as bad as inside homes. Could this be disrupting the balance and communications of bees. If I could I would leave my home and never come back, it gets so bad. Thank you for your comment, if I understand you correctly, each to their own I suppose. Man has taken honeybees away from the higher vibration which they seek out when swarming, and put them into boxes/beehives and put the bees unknowingly above the lower 7.83htz vibration which will lower their defences and then die. Above a 250htz vibration they will survive for many many years just by superceding the queen, why would they want to move? No need to move house just make sure your not sleeping above one of these lines, again use dowsing rods. John, so at 7.83 from some source it was documented? The high frequencies we and others measure are 40, 31, 16 ish Hz. Is there any work at these? Thank you so much for your kind comments, back in the UK all I seem to get is negativity. And yes Steve is right, thank you Steve, Dowsing or Divining, it is very simple to do, however I am currently working on Phase 2 which will bring it all into the 21st century. Thank you, I wish I could get more positive feedback in the UK. This is one big mystery. I had an talk with a local beekeeper. He had no problems with sick colonies. His solution? He only harvested 1/3 of all honey. The rest was left for the bee themselves. Think about it. Bee work the whole summer to collect food for winter. They collect honey, pollen, an complex mixture of nutrients. We, as people think we can substitute this for simple sugar water? Sugar is NOT the same as what they collect and want. Sugar lacks all kinds of micro nutrients, undermining natural resistance tot parasites. By not taking all the honey, this beekeeper respects the bees more than all those that “milk” colonies to the last drop of honey. Which is so typical to our race. Only thinking of our selves, and how things impacts our (future) lives. This reminds me of a chicken farmer around here. He told me he had the healthiest chickens in the land. Because they never had any illness. He had his chicks in small cages stacked 8 stories high! He confused sterile for healthy. He used toxic disinfectants to clean the barn. He used antibiotics to prevent illness. His chicks would be sick in one week if they would be allowed outside. Is this healthy? Not in my book. Thank you for your comment however you will notice in the above I too do not take all of the honey as I do not feed sugar or come to that chemicals and haven`t for almost 20 years, it does make a difference. You are quite right, thank you again. I read with great interest your pdf document which you kindly sent to me about a month ago. Since then I have been out in the field where my bees are located. I do get some response with the divining rods but how can I know if these mean a high enough hertz measurement or something else. The nature reserve I am able to use is very wet ground so water and underground streams are not a problem to find really. How will I know which twitching of the rods means a high enough electrical impulse to be useful for the bees? The ground sort is grey sea clay and is not very permeable. interesting read, somehow I missed it previously. have to agree, it seems common sense to leave one third honey for the bees, instead of feeding sugar water. Not the same food, at all.